Hepatocyte nuclear factor-1β (HNF-1β) is a transcription factor that regulates gene expression in the kidney, liver, pancreas, and other epithelial organs. Mutations of HNF-1β lead to a syndrome of inherited renal cysts and diabetes and are also a common cause of sporadic renal dysplasia. The full complement of target genes responsible for the functions of HNF-1β, however, is incompletely defined. Using a functional genomics approach involving chromatin immunoprecipitation and promoter arrays, combined with gene expression profiling, we found that an HNF-1β target gene in the kidney is kinesin family member 12 (Kif12), a gene previously identified as a candidate modifier gene in the cpk mouse model of polycystic kidney disease. Mutations of HNF-1β inhibited Kif12 transcription in both cultured cells and knockout mice by altering co-factor recruitment and histone modification. Because kinesin-12 family members participate in orienting cell division, downregulation of Kif12 may underlie the abnormal planar cell polarity observed in cystic kidney diseases. Mutations of HNF-1β (TCF2) in humans cause maturity-onset diabetes of the young type 5, an autosomal dominant disorder that is characterized by early-onset diabetes and congenital cystic abnormalities of the kidney.6, 7 The spectrum of kidney abnormalities includes simple cysts, multicystic dysplasia, and glomerulocystic kidney disease. The formation of cysts in the renal tubules has led to the alternative designation of the syndrome as renal cysts and diabetes. In addition, mutations or large deletions of HNF-1β have been detected in 31% of children with multicystic dysplasia, isolated cystic renal disease, and renal hypo/dysplasia.8 Inactivation of HNF-1β in the mouse kidney, either by Ksp-Cre–driven renal-specific inactivation of HNF-1β or expression of dominant negative mutants, results in kidney cyst formation and defects in transcription of the autosomal recessive polycystic kidney disease (ARPKD) gene, Pkhd1.9, 10 The expression of Umod and Pkd2, mutations of which are responsible for distinct cystic kidney diseases, is also decreased upon inactivation of HNF-1β9; therefore, HNF-1β not only is important for kidney development but also is a key regulator of cystic disease genes. Although several genes that are regulated by HNF-1β have been identified using candidate gene approaches, the full complement of target genes that are responsible for the physiologic and pathologic functions of HNF-1β remains unknown. Here, we used a functional genomics approach involving chromatin immunoprecipitation and DNA promoter arrays (ChIP-chip) together with mRNA microarray analysis to identify on a genome-wide scale the genes that are directly regulated by HNF-1β in the mouse kidney. Using this approach, we identified kinesin family member 12 (Kif12), a candidate PKD modifier gene, as a novel HNF-1β target gene. Identification of Kif12 as an HNF-1β target gene by combinatorial functional genomics analysis. (A) ChIP-chip enrichment of promoters on chromosome 4. The log2 ratios indicate the intensities of hybridization signals produced by genomic fragments immunoprecipitated with anti–HNF-1β antibody (green) or isotype IgG (black). (Bottom) Positions of annotated genes on chromosome 4. Arrow indicates the position of the Kif12 gene. (B) ChIP-chip enrichment of sequences bound to HNF-1β along the mouse Kif12 promoter. The hybridized genomic fragments were immunoprecipitated with anti–HNF-1β antibody (green) or isotype IgG (black). (C) Comparison between the ChIP-chip enrichment of genes in the kinesin family (left) and expression microarrays (right) identified significant changes exclusively in Kif12 mRNA levels after expression of the HNF-1βΔC mutant. Using combinatorial functional genomics, we identified Kif12 as a novel target gene of HNF-1β. ChIP-chip assays showed that HNF-1β binds the Kif12 promoter, as indicated by the enrichment of hybridization signals on the promoter (Figure 1B). Peak finding software located the binding site within a region approximately 150 bp upstream from the translation start site of Kif12. Expression of the HNF-1βΔC mutant in mIMCD3 cells reduced the levels of expression of Kif12 mRNA more than eight-fold (Figure 1C). Analysis of other members of the KIF family indicated that Kif12 was the only direct target gene of HNF-1β. Comparing the sequences of Kif12 promoters from different species revealed that the HNF-1β binding site was located within a highly conserved region (Figure 2A). The conserved region contained a consensus binding site for HNF-1β, which was located 150 bp upstream from the translation start site and 24 bp upstream from the transcription start site as determined by comparing the mRNA and genomic sequences (Figure 2B). In addition, the mouse Kif12 promoter contained potential binding sites for other important transcription factors, including AP-1, NF-y, and GATA-3 (Figure 2C). The Kif12 promoter contains a consensus HNF-1β binding site that is highly conserved among different mammalian species. (A) Alignment of Kif12 promoter sequences from mouse, rat, dog, and human showing evolutionarily conserved regions. The HNF-1β binding site identified by ChIP-chip (bar) was located within a conserved region 150 bp upstream from the translation start site. (B) Sequence alignment of the highly conserved region in the Kif12 promoter revealed a consensus sequence for an HNF-1β binding site. (C) Locations of consensus transcription factor binding sites on the mouse Kif12 promoter. To confirm that Kif12 was a direct target gene of HNF-1β, we performed ChIP assays using chromatin from mIMCD3 cells. We isolated genomic fragments bound by HNF-1β by immunoprecipitation and measured the presence of Kif12 promoter sequences by PCR using primers flanking the HNF-1β–binding site (Figure 3A). The Kif12 promoter sequence was enriched by immunoprecipitation with anti–HNF-1β antibody compared with isotype IgG, indicating that HNF-1β was associated with the Kif12 promoter in mIMCD3 cells (Figure 3B). In contrast, there was no enrichment of other regions of Kif12, such as coding sequence or 3′-untranslated region (Figure 3B). To confirm binding in vivo, we performed ChIP experiments using chromatin extracted from mouse kidneys. In agreement with the data obtained in mIMCD3 cells, immunoprecipitation with anti–HNF-1β antibody resulted in enrichment of Kif12 promoter fragments (Figure 3C). These results confirmed that HNF-1β was associated with the Kif12 promoter both in vitro and in vivo. To determine whether HNF-1β and Kif12 were coexpressed in the same cell population in the kidney, we stained sections of adult mouse kidney with antibodies against HNF-1β and Kif12. Collecting ducts were labeled by co-staining with Dolichos biflorus agglutinin (DBA). As shown in Figure 3D, both HNF-1β and Kif12 were expressed in DBA-positive collecting ducts. Taken together, these findings suggest that Kif12 is a target gene of HNF-1β in the kidney. Validation of the in vivo association of HNF-1β with the Kif12 promoter. (A) Schematic diagram of the mouse Kif12 promoter. Arrows indicate primers that were used for ChIP assays of the promoter (P1 and P2), coding sequence (P3 and P4), and 3′-untranslated region (P5 and P6). (B) Occupancy of the Kif12 promoter by endogenous HNF-1β in chromatin from mIMCD3 cells was verified by ChIP assay. (C) In vivo association of HNF-1β and the Kif12 promoter in chromatin from mouse kidney was confirmed by ChIP assay. (D) Kidney sections from adult mice were co-stained with antibodies against HNF-1β (red, a and b) or Kif12 (red, c and d) and DBA (green, b and d). HNF-1β was localized in the nuclei and Kif12 was localized in the cytosol of DBA-positive collecting duct cells. Bars = 10 μm. To determine whether HNF-1β regulates the expression of Kif12, we measured the levels of Kif12 mRNA transcripts in mIMCD3 cells expressing mutant HNF-1β. As described already, we created a dominant negative HNF-1β mutant (HNF-1βΔC) by deleting the C-terminal transactivation domain. In addition, we added N-terminal Flag and C-terminal EGFP epitope tags to facilitate detection of the mutant protein (Figure 4A). mIMCD3 cells were stably transfected with inducible expression plasmids encoding HNF-1βΔC and treated with mifepristone (or vehicle alone as a negative control). Treatment with mifepristone induced expression of the HNF-1βΔC mutant as indicated by immunoblot analysis with anti-Flag antibody (Figure 4B). Immunoprecipitation with an anti-Flag antibody resulted in enrichment of Kif12 promoter fragments, indicating that HNF-1βΔC binds to the Kif12 promoter in transfected mIMCD3 cells (Figure 4C). Real-time reverse transcriptase–PCR (RT-PCR) analysis showed that the expression of the HNF-1βΔC mutant reduced the levels of Kif12 mRNA by approximately 90%, indicating that the loss of function of HNF-1β inhibited the expression of Kif12 (Figure 4D). As a control, treatment of parental mIMCD3 cells with mifepristone had no effect on the expression of Kif12 (Figure 4E). To investigate the effects of inactivation of HNF-1β on the expression of Kif12 in vivo, we measured the levels of Kif12 mRNA in the kidneys from knockout mice lacking HNF-1β. We used Cre/loxP recombination to inactivate HNF-1β specifically in the kidney, as described previously.9 Kidney-specific HNF-1β knockout mice developed renal cystic disease in which the renal medulla was almost completely replaced by multiple large cysts (data not shown). Real-time RT-PCR analysis showed that the levels of Kif12 mRNA were decreased approximately 70% in the kidneys from HNF-1β knockout mice compared with wild-type controls (Figure 4F). Taken together, these results indicate that HNF-1β regulates the expression of Kif12 both in vitro and in vivo. HNF-1β is required for the expression of Kif12 in mIMCD3 cells and mouse kidney. (A) Schematic diagram of wild-type mouse HNF-1β (top) and the dominant negative HNF-1βΔC mutant. Boxes indicate Flag (red) and EGFP (green) epitope tags. (B) Expression of the HNF-1βΔC mutant was confirmed by immunoblot analysis of lysates from mIMCD3 cells induced with mifepristone (Mif). (C) The in vivo association of the HNF-1βΔC mutant with the Kif12 promoter was confirmed by ChIP assay using an anti-Flag antibody in transfected mIMCD3 cells (n = 3). (D) Induction of the HNF-1βΔC mutant in mIMCD3 cells resulted in decreased expression of endogenous Kif12 mRNA (n = 6). (E) Treatment of parental mIMCD3 cells with mifepristone had no effect on the expression of Kif12 mRNA. (F) Kif12 mRNA expression was decreased in cystic kidneys from P8 kidney-specific HNF-1β knockout mice compared with wild-type controls. Error bars indicate SD (n = 3). The preceding results suggested that HNF-1β functioned as a transcriptional activator on the Kif12 promoter. To test this possibility, we cloned the mouse Kif12 promoter and linked it to a luciferase reporter gene. mIMCD3 cells were transfected with the Kif12 promoter-reporter plasmid, and we measured luciferase activity after induction of the HNF-1βΔC mutant with mifepristone. Expression of the dominant negative mutant reduced the activity of the Kif12 promoter by approximately 60% (Figure 5A). To verify the functional importance of the HNF-1β binding site on the Kif12 promoter, we mutated the consensus binding site in the promoter-reporter plasmid and measured the effects in wild-type mIMCD3 cells that endogenously express HNF-1β (Figure 5B). Mutation of the HNF-1β binding site reduced the activity of the Kif12 promoter by approximately 80% (Figure 5B). To investigate further the regulation of Kif12 transcription by HNF-1β, we co-transfected HeLa cells, which lack endogenous HNF-1β, with increasing amounts of expression plasmids encoding HNF-1β or HNF-1βΔC (or empty pcDNA3 as a negative control) and the Kif12 promoter-reporter plasmid. Transfection of wild-type HNF-1β stimulated Kif12 promoter activity, whereas transfection of the HNF-1βΔC mutant failed to increase activity (Figure 5C); therefore, HNF-1β is a transcriptional activator of the Kif12 gene, and the intact protein and binding site both are crucial for Kif12 transcription. HNF-1β is essential for transcription of the Kif12 gene. (A) Induction of the HNF-1βΔC mutant in mIMCD3 cells resulted in decreased activity of the Kif12 promoter. (B) Site-directed mutation of the HNF-1β binding site in the Kif12 promoter inhibited promoter activity in wild-type mIMCD3 cells. (C) Transfection of HeLa cells with increasing amounts of plasmids encoding wild-type HNF-1β (0.00, 0.25, and 0.50 μg) stimulated Kif12 promoter activity, whereas transfection of the HNF-1βΔC mutant failed to increase activity compared with empty pcDNA3. (D) Induction of the HNF-1βΔC mutant decreased acetylation of histones H3 and H4 on the Kif12 promoter as revealed by ChIP assays. Acetylation of H3 K9 was decreased after expression of the HNF-1βΔC mutant, whereas monomethyl-H3K9 and trimethyl-H3K9 were increased. Binding of CBP on the Kif12 promoter was decreased after expression of the HNF-1βΔC mutant. Error bars indicate SD. To elucidate the mechanism of HNF-1β–dependent transcriptional activation of Kif12, we investigated the changes in histone modification and binding of co-activators on the Kif12 promoter. Histone modifications are major regulatory steps in eukaryotic gene transcription, because modifications such as acetylation, methylation, and phosphorylation affect the conformation of chromatin and the interaction of transcription regulatory complexes with the promoter.12 To measure histone modifications, we performed ChIP assays using antibodies that recognize acetylation and methylation of specific histone residues. ChIP assays of histones bound on the Kif12 promoter showed that the acetylation of lysine-9 (K9) on histone H3 and the acetylation of histone H4 were decreased upon expression of the HNF-1βΔC mutant (Figure 5D). 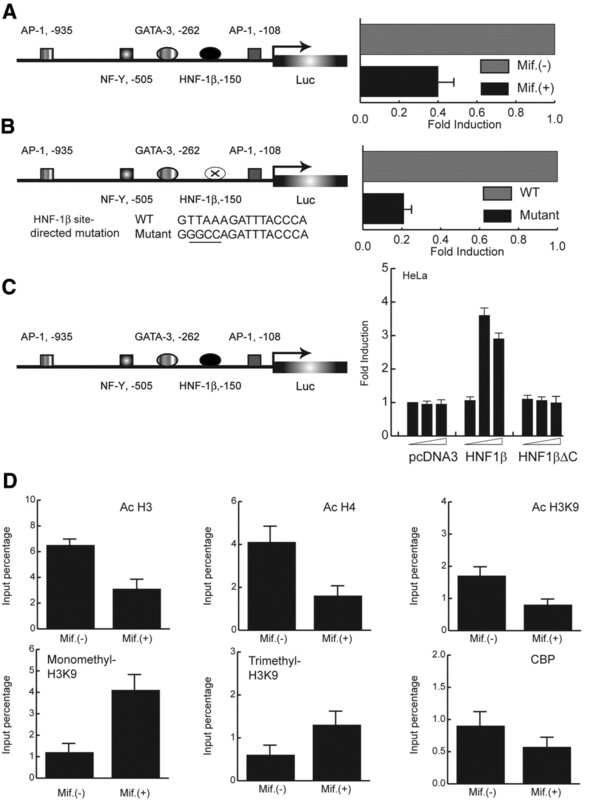 Because acetylation of histones H3 and H4 is a marker of transcriptional activation, this result is in agreement with the loss of HNF-1β–inhibiting transcription of Kif12. Conversely, two markers of transcriptional repression, monomethyl-H3K9 and trimethyl-H3K9, were increased upon expression of the HNF-1βΔC mutant (Figure 5D). Histone acetylation may be mediated by transcriptional co-activators, such as CBP, which has been shown to interact with the C-terminal domain of HNF-1β.3 ChIP analysis showed that the binding of CBP to the Kif12 promoter was decreased upon expression of the HNF-1βΔC mutant (Figure 5D). These results suggest that HNF-1β potentiates Kif12 gene transcription by enhancing the binding of CBP and increasing acetylation while simultaneously suppressing methylation on histone H3K9. Kif12 has been identified as a candidate modifier gene in the cpk mouse model of ARPKD.13 Similar to humans with ARPKD, homozygous cpk mutant mice develop biliary dysgenesis and cysts in the renal collecting ducts; however, the severity of the phenotype varies depending on the genetic background. Using genome-wide quantitative trait loci analysis, Mrug et al.13 identified a locus on chromosome 4 that has a major effect on the severity of the renal and biliary phenotypes in cpk mutant mice. Further mapping and haplotype analysis identified Kif12 as a candidate gene within the chromosome 4 quantitative trait loci. DNA sequencing revealed the presence of a species-specific allelic variant consisting of a 15-bp insertion that produces a 5–amino acid in-frame insertion within the motor domain of Kif12. Moreover, the expression of Kif12 mRNA is reduced in kidneys from wild-type mice carrying the allelic variant. Our observations that HNF-1β regulates Kif12 transcription and that the expression of Kif12 is reduced in cystic kidneys from HNF-1β mutant mice further supports a role of Kif12 in PKD. Downregulation of Kif12 may contribute to cyst formation in HNF-1β mutant mice and possibly also in humans with maturity-onset diabetes of the young type 5/renal cysts and diabetes. Alterations in Kif12 expression may also underlie the biliary tract abnormalities produced by liver-specific inactivation of HNF-1β. Kif12 belongs to the kinesin superfamily of motor proteins that bind microtubules and mediate the intracellular transport of organelles and protein complexes.14 Kif12 is highly expressed in the kidney, and SAGE-based analysis of nephron segments indicates that KIF12 is primarily expressed in collecting ducts.13 Kif12 belongs to a subfamily of kinesins that includes mouse Kif15, Xenopus Klp2, and Arabidopsis PaKRP1.14 Although the function of mammalian Kif12 is not known, other members of the kinesin-12 subfamily play important roles in mitotic spindle formation and cytokinesis.15–17 One study identified kinesin-12 family members in Arabidopsis that are required for properly orienting the mitotic spindle apparatus during cell division.18 This finding is particularly intriguing because abnormalities in the orientation of cell division have been observed in mice with mutations of HNF-1β and may contribute to cyst formation.19 The mitotic spindles in dividing cells are normally oriented parallel to the longitudinal axis of the tubule, whereas HNF-1β mutant mice exhibit alterations in mitotic orientation such that cell division results in tubular dilation rather than elongation. Our studies on Kif12 transcription provide important insights into the mechanism of transcriptional activation by HNF-1β. The C-terminal region of HNF-1β contains a transcriptional activation domain that interacts with co-activators CBP and P/CAF.3 CBP has intrinsic histone acetylase activity, and treatment with histone deacetylase inhibitors stimulates HNF-1β–dependent transcription. Here, we showed that CBP and HNF-1β occupy the Kif12 promoter in the context of native chromatin. Expression of an HNF-1β mutant, which lacks the C-terminal domain that mediates the interaction with CBP, decreases the binding of CBP to the Kif12 promoter. Moreover, the inhibition of CBP binding is associated with a corresponding decrease in acetylation of histones H3 and H4. These findings suggest that HNF-1β binds to target promoters and recruits CBP through its C-terminal domain. CBP in turn mediates histone acetylation and chromatin remodeling, which promote gene transcription. C-terminal truncation mutants bind to the promoter but cannot recruit CBP, which results in decreased histone acetylation, increased methylation, and gene silencing. mIMCD3 cells and mIMCD3 cells expressing the HNF-1βΔC mutant were grown in DMEM supplemented with 10% FBS. C57BL/6J mice were purchased from Jackson Laboratory (Bar Harbor, ME). 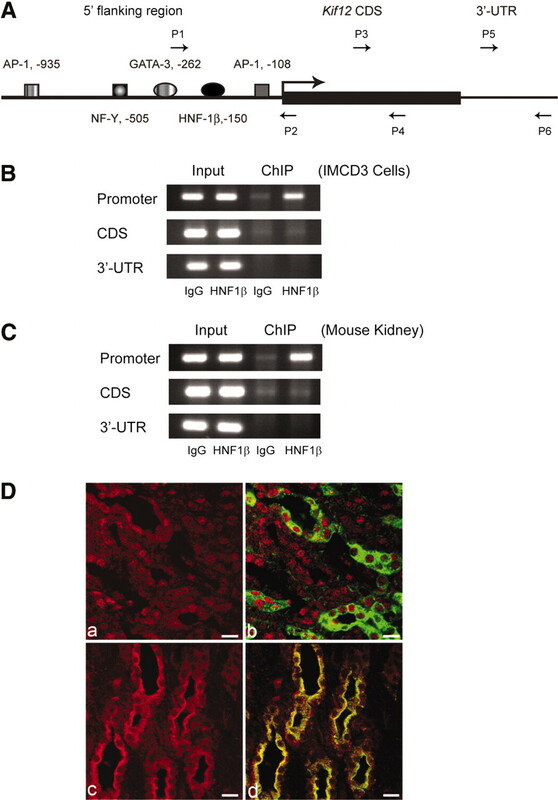 Kidney-specific inactivation of HNF-1β was achieved using Cre/loxP recombination by crossing Ksp-Cre mice with HNF1βflox/flox mice as described previously.9 All animal procedures were performed in accordance with the guidelines of the Institutional Animal Care and Use Committees of the University of Texas Southwestern Medical Center and Institut Pasteur. Antibodies used were rabbit anti–HNF-1β (sc-22840; Santa Cruz Biotechnology, Santa Cruz, CA), rabbit anti-histone modification antibodies (Upstate, Lake Placid, NY), and rabbit anti-Kif12 (ProteinTech Group, Chicago, IL). We performed ChIP assays as described previously.20 mIMCD3 cells and mouse kidney tissue fragments were cross-linked with 1% formaldehyde at room temperature. Chromatin was extracted from the nuclei, sonicated, and immunoprecipitated with anti–HNF-1β antibody. We amplified immunoprecipitated DNA using promoter-specific primers and quantified it using real-time PCR. For ChIP-chip analysis, we amplified the immunoprecipitated DNA by LM-PCR as described previously.11, 21 LM-PCR products were fluorescently labeled and hybridized to promoter tiling arrays that covered 1.5 kb of the promoter regions of 26,842 mouse genes (NimbleGen Systems, Madison, WI). We analyzed the scanned images of the hybridized arrays using NimbleScan 2.0 (NimbleGen Systems). We converted the raw microarray data into scaled log ratios and visualized them using SignalMap software (NimbleGen Systems). We performed data analysis and target identification as described previously.21 To locate HNF-1β binding sites, we used Peak Finding software (Ren Lab, UCSD, San Diego, CA). We used a significance threshold of P ≤ 0.2 as the cutoff for defining binding sites. The ChIP-chip data are available on the web site of the UT Southwestern O’Brien Kidney Research Core Center (http://www.utsouthwestern.edu/nephrology/obrien/researchdatarepository.html). We prepared kidney cryosections from adult mice (age 6 wk) and performed antigen retrieval with thiocyanic acid and guanidine (Liberate Antibody Binding solution; Polysciences, Warrington, PA). We quenched the reaction with 0.5 M ammonium chloride and incubated the slides in blocking buffer (10% goat serum, 0.3% bovine serum, and 1 × PBS). We incubated sections with rabbit anti–HNF-1β antibody (1:400) or rabbit anti-Kif12 antibody (1:200) at 4°C overnight and then with Alexa Fluor 594–conjugated goat anti-rabbit IgG (1:400). To label the collecting ducts, we co-stained the sections with biotinylated DBA (1:400; Vector Laboratories, Burlingame, CA) and detected them with fluorescein-conjugated avidin D (1:400; Vector Laboratories). We acquired photomicrographs using an LSM510 META confocal laser scanning microscope (Zeiss, Jena, Germany) and analyzed them with Imaris software (Bitplane AG, Zurich, Switzerland). Total RNA was extracted using Trizol (Invitrogen, Carlsbad, CA) and RNase Mini Kits (Qiagen, Valencia, CA). RNA was reverse-transcribed, and the cDNA was fluorescently labeled and hybridized with mouse expression arrays 430A and 430B (Affymetrix, Santa Clara, CA). Real-time PCR was performed in triplicate using iCycler and SYBR green Supermix reagents (Bio-Rad Laboratories, Hercules, CA). β2-Microglobulin was used as the control gene for normalization. We analyzed data using IQ5 software (Bio-Rad Laboratories). We amplified the mouse Kif12 promoter using long-range PCR kits (Roche, Indianapolis, IN) and subcloned it into pGL3-Basic vector (Promega, Madison, WI). We confirmed the integrity of the promoter sequence by sequencing. We transfected cells using Fugene reagent (Roche) and 48 h later lysed the cells and measured luciferase activity. We performed site-directed mutagenesis using QuikChange kit (Stratagene, La Jolla, CA). We confirmed the presence of the desired mutation by DNA sequencing. This study was supported by National Institutes of Health grant R01DK42921 (to P.I. ), FRM grant FRMDEQ20061107958 (to M.P. ), and the UT Southwestern O'Brien Kidney Research Core Center (P30DK079328). Z.M. is supported by a PKD Foundation fellowship. V.P. is supported by a National Institutes of Health training grant (T32DK07257). E.F. is an INSERM researcher. We thank Patricia Cobo-Stark, Eric Gourley, and Serge Garbay for expert technical assistance. Y.G. and Z.M. contributed equally to this work.